Buying or selling a home is more than just a transaction: it’s a life-changing experience and Mia is dedicated to providing personalized customer service for all of her clients. She takes great pride in the relationships she builds and will always work tirelessly on the client’s behalf to help them achieve their real estate goals. Mia, a native of Fort Worth, was raised in Arlington following her family’s relocation. 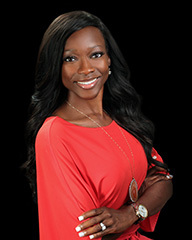 She attended UT Austin for her undergraduate studies and earned a Masters degree from UT Arlington in 2006. Mia has been an educator in Fort Worth ISD since 2000 where she climbed the ranks from substitute teacher to Principal. Mia is married to Ibo Hall, owner of Innovative Air, LLC and they have one son, Xavier. Mia is extremely excited about her new career in Real Estate and you can count on her to provide extraordinary service and exceptional results!